COMMENTS:        The starting/seed location came from LAT. COMMENTS:        An energy cut was applied to the gammas used for the localization. COMMENTS:        This trigger occurred at longitude,latitude = 91.58,25.03 [deg]. COMMENTS:        NOTE: This GBM event is temporally(1.0<100sec) coincident with the CALET_GBM event (trignum=1150929566). COMMENTS:        NOTE: This GBM event is temporally(15.0<100sec) coincident with the SWIFT_BAT event (trignum=701503). COMMENTS:        NOTE: This GBM event is temporally(2.0<100sec) coincident with the INTEGRAL_SPIACS event (trignum=7495). At 22:43:24 on June 25, 2016, Fermi/LAT detected a sharp increase in the rate of high-energy photons, resulting in an onboard trigger on GRB 160625B. Fermi/GBM triggered on this object two separate times (160625945/488587220, 160625952/488587880), with emission evident between triggers, including the time at which LAT triggered. Note that all of these triggers are distinct from the Swift/BAT trigger on GRB160625A (Maselli et al., GCN 19577) that occurred 15 seconds after the first GBM trigger, and was occulted by the Earth to Fermi at the time, and >100 degrees away on the sky. with an error radius of 0.5 deg (90% containment, systematic error only). This was 12.3 deg from the LAT boresight at the time of the LAT trigger. We anticipate providing a refined location within the next 8 hours when the LAT science data for this burst is downlinked and processed. A Swift TOO request has been approved, and given the unusual nature of this trigger, a Fermi TOO will extended the pointed-mode observations to T0+24 hours beyond the initial autonomous repoint. The Fermi-LAT point of contact for this burst is Feraol Dirirsa (fdirirsa@uj.ac.za). "At 22:40:16.28 UT on 25 June 2016, the Fermi Gamma-Ray Burst Monitor triggered and located GRB 160625B for the first time (trigger 488587220 / 160625945). The trigger resulted in an Autonomous Repoint Request (ARR) by the GBM Flight Software owing to the high peak flux of the GRB. This ARR was accepted and the spacecraft slewed to the GBM in-flight location. The initial angle from the Fermi LAT boresight to the GBM ground location is 40 degrees. At 22:43:24.82 the Fermi LAT triggered on a bright pulse from the same GRB (Dirirsa et al. 2016, GCN 19580). Owing to the ARR the initial angle from the Fermi LAT boresight to the LAT position at LAT trigger time was 12 degrees. At 22:51:16.03 GBM triggered again on GRB 160625B (trigger 488587880 / 160625952). GRB 160625B is distinct from the Swift BAT GRB 160625A (Maselli et al. 2016, GCN 19577). The GBM light curve consists of multiple peaks over approximately 700 seconds. The first peak is soft with a duration of about 1 second. The main peak, corresponding to the LAT trigger, is about 25 seconds long and is very hard. The peak that triggered GBM for the second time is about 30 seconds long and soft. Standard GBM temporal and spectral analysis is awaiting downlink of the full dataset and will be reported when available." Swift-XRT has performed follow-up observations of the Fermi/LAT-detected burst GRB 160625B (Dirirsa et al. GCN Circ. 19580) in a series of observations tiled on the sky. The total exposure time is 2.7 ks, distributed over 8 tiles; the maximum exposure at a single sky location was 1.1 ks. The data were collected between T0+9.6 ks and T0+10.0 ks, and are entirely in Photon Counting (PC) mode. with an uncertainty of 3.8 arcsec (radius, 90% confidence). This position is 19.7 arcmin from the Fermi/LAT position. The light curve can be modelled with a power-law decay with a decay index of alpha=3.156 (+0.011, -2.764). A spectrum formed from the WT mode data can be fitted with an absorbed power-law with a photon spectral index	of 2.09 (+0.20, -0.19). The best-fitting absorption column is 1.6 (+/-0.6) x 10^21 cm^-2, in excess of the Galactic value of 9.8 x 10^20 cm^-2 (Willingale et al. 2013). The counts to observed (unabsorbed) 0.3-10 keV flux conversion factor deduced from this spectrum is 3.1 x 10^-11 (4.3 x 10^-11) erg cm^-2 count^-1. If the light curve continues to decay with a power-law decay index of 3.156, the count rate at T+24 hours will be 6.1 x 10^-3 count s^-1, corresponding to an observed (unabsorbed) 0.3-10 keV flux of 1.9 x 10^-13 (2.6 x 10^-13) erg cm^-2 s^-1. The results of the XRT-team automatic analysis of the likely afterglow are at http://www.swift.ac.uk/xrt_products/TILED_GRB00056/index_1.php. The results of the full analysis of the tiled XRT observations are available at http://www.swift.ac.uk/xrt_products/TILED_GRB00056. F. Dirirsa (U. Johannesburg), G. Vianello (Stanford), J. Racusin (NASA/GSFC), and M. Axelsson (KTH Stockholm) report on behalf of the Fermi-LAT team: We report the on-ground localization and analysis of GRB 160625B, which triggered the LAT onboard (Dirisa et al., GCN 19580). All times are relative to the initial GBM trigger (Burns et al, GCN 19581). The best LAT on-ground location is found to be: RA, Dec = 308.56, 6.93 deg (J2000) with an error radius of 0.06 deg (90 % containment, statistical error only). This is fully compatible with the position of the afterglow detected by Swift/XRT (Melandri et al., GCN 19585). This was 42 deg from the LAT boresight at the time of the GBM trigger and triggered an autonomous repoint of the spacecraft. More than 300 photons were detected above 100 MeV. The LAT emission became detectable during the second bright pulse observed by GBM at ~T0+181 s. The highest-energy photon is a 15 GeV event which is observed ~345 seconds after the GBM trigger. The GRB was detectable by the LAT up to ~1 ks after the trigger. Data are still being collected, and pointed mode observations are continuing to maximize exposure to the GRB location. The Fermi-LAT point of contact for this burst is Feraol Dirirsa (fdirirsa@uj.ac.za ). The Fermi-LAT is a pair conversion telescope designed to cover the energy band from 20 MeV to greater than 300 GeV. It is the product of an international collaboration between NASA and DOE in the U.S. and many scientific institutions across France, Italy, Japan and Sweden. "We report temporal and spectral analysis on GRB 160625B, covering all three Fermi trigger times (LAT trigger 488587408 / 160625947 GBM triggers 488587220 / 160625945 and 488587880 / 160625952). All times are relative to the first GBM trigger time. 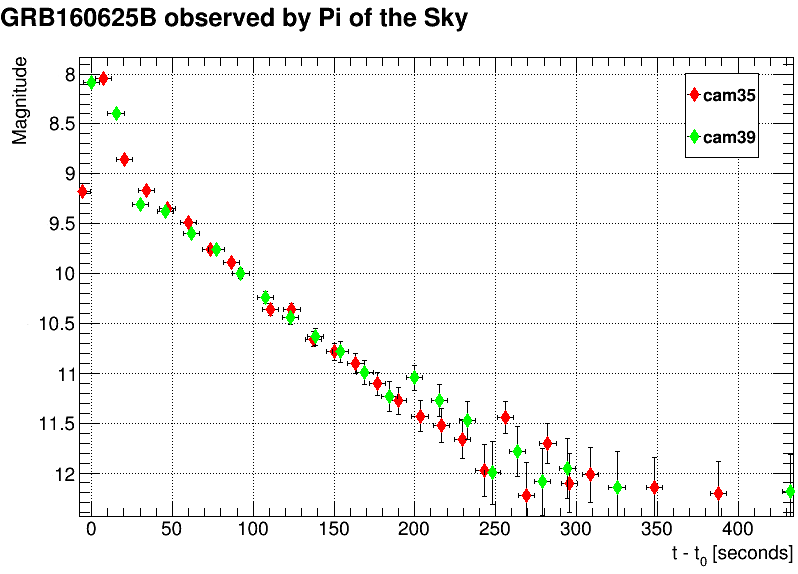 The GBM light curve consists of multiple peaks with a total duration (T90) of about 460 s (50-300 keV). The 1.024-sec peak photon flux of the main peak measured starting from T0+188.707 s in the 10-1000 keV band is 167 +/- 1 ph/s/cm^2. The soft peak that initially triggered GBM is about 1 second long. The time-averaged spectrum from T0+0.002 s to T0+1.056 s is well fit by a power law function with an exponential high-energy cutoff. The power law index is -0.2 +/- 0.1 and the cutoff energy, parameterized as Epeak, is 68 +/- 1 keV. The event fluence (10-1000 keV) in this time interval is (1.65 +/- 0.03)E-06 erg/cm^2. 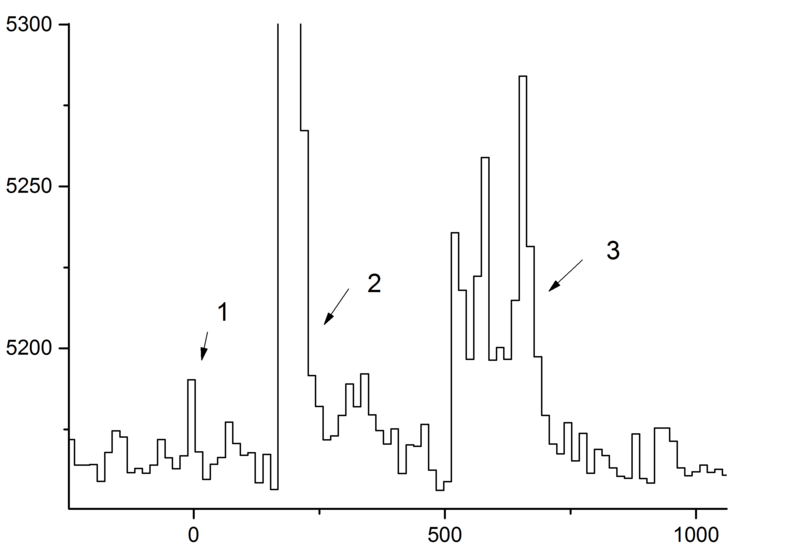 The main peak that triggered the LAT is about 25 seconds long. The time-averaged spectrum from T0+187.427 s to T0+212.003 s is well fit by a Band function with Epeak = 657 +/- 5 keV, alpha = -0.74 +/- 0.00, and beta = 2.36 +/- 0.01. The event fluence (10-1000 keV) in this time interval is (5.00 +/- 0.01)E-04 erg/cm^2. We observed the field of the Fermi LAT GRB 160625B (Dirirsa, et al., GCN 19580) with the Reionization and Transients Infrared Camera (RATIR; www.ratir.org) on the 1.5m Harold Johnson Telescope at the Observatorio Astron=F3mico Nacional on Sierra San Pedro M=E1rtir from 2016/06 26.30 to 2016/06 26.32 UTC (8.5 3 to 9.02 hours after the LAT trigger), obtaining a total of 0.36 hours exposure in the r and i bands and 0.15 hours exposure in the Z, Y, J and H bands. The Swift/UVOT began settled observations of the field of GRB 160625B 9616 s after the LAT trigger (Dirirsa et al., GCN Circ. 19580). A source consistent with the RATIR position (Troja et al. GCN Circ. 19588) and the edge of the XRT position (Melandri et al. GCN Circ. 19585) is detected in the initial UVOT exposures. The magnitudes in the table are not corrected for the Galactic extinction due to the reddening of E(B-V) =3D 0.12 in the direction of the burst (Schlegel et al. 1998). We observed the field of GRB 160625B (Dirirsa et al., GCNC 19580; Melandri et al., GCNC 19585) with the optical three color (g', Rc and Ic) CCD camera attached to the Murikabushi 1m telescope of Ishigakijima Astronomical Observatory. The observation started on 2016-06-26 14:03:44 UT (~15.3 h after the burst). We detected the previously reported afterglow (Troja et al., GCNC 19588) in in all the three bands. The photometric results of the OT are listed below. We used GSC2.3 catalog for flux calibration. We observed the optical afterglow of the Fermi GRB 160625B (Dirirsa et al., GCN 19580; Burns, GCN 19581; Troja et al., GCN 19588) with the ESO VLT UT2 (Kueyen) equipped with the X-shooter spectrograph. Observations started on 2016 June 27.19 UT (1.25 days after the Fermi trigger) and consisted of 4 spectra by 600 s each, covering the wavelength range 3500-20000 AA. The afterglow is well detected in the acquisition image with R ~ 19.1 +- 0.3, where the large error is due to scatter in the USNO magnitudes used as reference, and the r versus R filter transformation. The continuum trace is well detected in our exposures, down to ~3100 AA. The lack of any drop sets an upper limit to the redshift z < 1.55. A number of superimposed absorption features are visible; among others, we detect Mg I, Mg II, Fe II, C IV, Si IV, O I, Si II, Zn II, Al II, and Al III, all at a common redshift z = 1.406, which we conclude to be the redshift of GRB 160625B. We also detect an intervening Mg II absorption system at z = 1.319. At z = 1.406, the fluence in the 10-1000 keV Fermi band (Burns, GCN 19587) corresponds to an isotropic-equivalent energy of ~2.5*10^54 erg. We acknowledge excellent support from the ESO observing staff in Paranal, in particular Juan Carlos Munoz, Elizabeth (Liz) Bartlett, Dimitri Gadotti and Francisco Caceres. We observed the afterglow of GRB 160625B (Dirirsa et al., GCN 19580) with the TNG equipped with DOLORES and the LR-B grism. The spectrum was acquired on 2016-06-26 and covers the range between 3000 and 7800 AA. The observation consisted of 2400 s exposure, starting at 23:04:20.836 (24 hr after the trigger). The optical counterpart is clearly detected in the acquisition images with a magnitude r =3D 19.0 +/- 0.3 at the position reported by Troja et al. (GCN 19588) and Oates and D'A=EF=BF=BD (GCN 19589). The spectrum shows a clear continuum. We detect absorption features consistent with Mg I, Mg II, Mn II and Fe II lines a redshift of z =3D 1.41 +/= - 0.01, thus confirming the redshift reported by Xu et al. (GCN 19600). We thanks the TNG staff for excellent support, in particular Luca di Fabrizio and Albar Garcia. We observed the field of the Fermi LAT GRB 160625B (Dirirsa, et al., GCN 19580) with the Reionization and Transients Infrared Camera (RATIR; www.ratir.org) on the 1.5m Harold Johnson Telescope at the Observatorio Astron=F3mico Nacional on Sierra San Pedro M=E1rtir from 2016/06 27.36 to 2016/06 27.47 UTC (33.89 to 36.56 hours after the BAT trigger), obtaining a total of 1.73 hours exposure in the r and i bands and 0.73 hours exposure in the Z, Y, J, and H bands. The afterglow has faded by about 1.20 magnitude in all bands compared to our earlier epoch, confirming the fading seen during the first epoch. The fading is consistent with a temporal index of -0.90. The on-sky position of GRB 160625B (Dirirsa et al., GCN Circ. 19580) has been observed by Mini-MegaTORTORA nine-channel wide-field monitoring system with high temporal resolution (http://mmt.favor2.info) before, during and just after the LAT trigger time (T0 = 2016-06-25 22:43:24). Mini-MegaTORTORA reacted to Fermi GBM trigger 488587220 and started observing its error box at 2016-06-25 22:41:07, 52 seconds after GBM trigger and 136 seconds before LAT trigger. Due to large size of error box, the observations have been performed in "widefield+deep" regime, with channels simultaneously covering ~30x30 deg field of view with 30 s exposures in white light to achieve deepest detection limit. The system acquired 20 frames in such regime, covering time interval from T0-136 to T0+466 s.
The system detected a bright optical flash on a frame coincident with LAT trigger time (T0-15.9 - T0+14.1 s) at position reported by Troja et al. (GCN Circ. 19588), with a magnitude of about V=8.8 mag. Next frame displayed a slight rebrightening of about 0.1 mag, and then the light curve followed nearly smooth power-law decay with slope of about -1.6, down to V=12.2 at last acquired frame. The images acquired prior to LAT trigger do not display any object at that position down to about V=13.5 mag. The system also reacted to second GBM trigger 488587880 with slightly different coordinates, and due to large field of view again covered the position of a transient, acquiring 20 more frames from T0+1691 to T0+2264 s. No object is seen in these frames down to about V=13.5 mag. Further analysis and calibration of the data is ongoing. The long-duration, extremely bright GRB 160625B (Fermi-LAT detection: Dirirsa et al., GCN Circ. 19580; Fermi-GBM detection: Burns, GCN Circ. 19581) triggered Konus-Wind at T0=81619.875 s UT (22:40:19.875). The burst light curve starts, at ~T0-0.3 s, with a short soft initial pulse (precursor) which had a duration of about 1 s. The precursor is followed, starting at ~T0+180 s, by the main, extremely bright and spectrally-hard episode with a duration of about 40 s. This episode evolves into a weak emission traceable up to ~T0+680 s. The emission in the main episode is seen up to ~20 MeV. As observed by Konus-Wind, the burst had a fluence of 9.44(-0.16,+0.16)x10^-4 erg/cm2, and a 256-ms peak flux, measured from T0+188.928 s, of 1.26(-0.10,+0.10)x10^-4 erg/cm2/s (both in the 20 keV - 10 MeV energy range). Assuming the redshift z=1.406 (Xu, et al., GCN Circ. 19600) and a standard cosmology model with H_0 = 70 km/s/Mpc, Omega_M = 0.27, and Omega_Lambda = 0.73, we estimate the following rest-frame parameters: the isotropic energy release E_iso is ~5.0x10^54 erg, the peak luminosity L_iso is ~1.6x10^54 erg/s, and the rest-frame peak energy of the time-integrated spectrum, Ep,i, is ~1.3 MeV. This Eiso is the highest one measured by Konus-Wind for more than 21 years of its GRB observations and, probably, the highest Eiso recorded for a GRB ever. The GRB 160625B triggered Fermi LAT and GBM (Dirirsa et al., GCN 19580; Burns et al. GCN 19581), Konus-Wind (Svinkin et al. GCN 19604) and D. Kann (GCN 19579) reported about CALET and SPI-ACS/INTEGRAL trigger. The SPI-ACS time profile of GRB 160625B consists of 3 episodes of total duration about 750 seconds and compatible with time profiles reported by GBM (Burns, GCN 19581) and Konus-Wind (Svinkin et al. GCN 19604). consistent with the position of the optical afterglow (Troja et al., GCN 19588; Oates et al., GCN 19589) and the Swift/XRT position (Melandri et al., GCN 19585). Follow-up observations are planned. We observed the Fermi/LAT GRB 160625B (Dirirsa et al., GCN 19580) with the AMI Large Array at 15 GHz on 2016 Jun 28.06 (UT), 2.1 days post-burst, as part of the 4pisky program. We detect a radio source consistent with the VLA location (Alexander et al., GCN 19606) at 640+/-40 uJy. 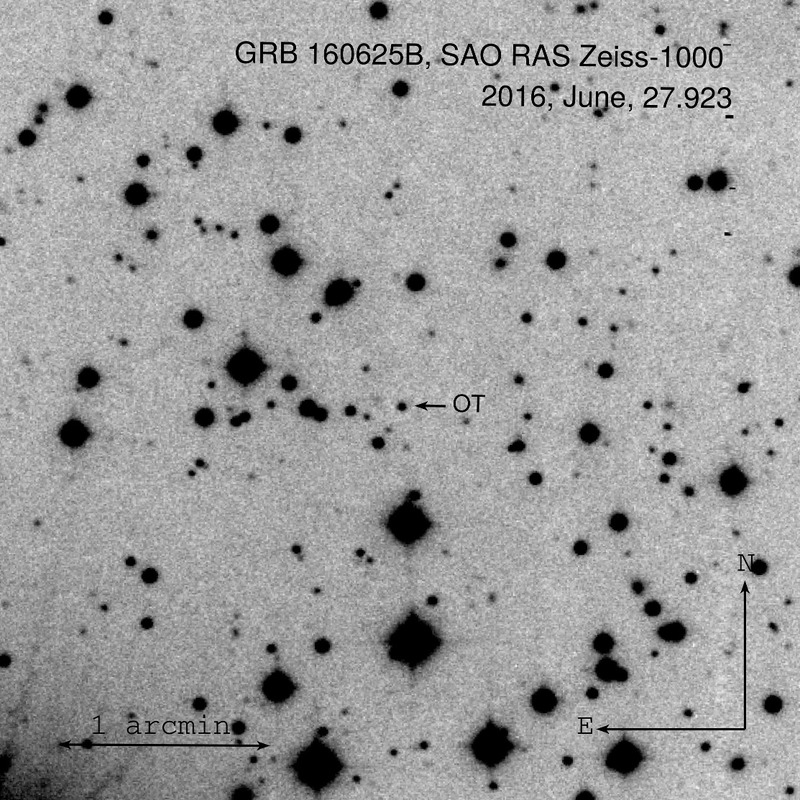 MASTER-IAC robotic telescope (MASTER-Net: http://observ.pereplet.ru) was pointed to the GRB 160625B (Burns et al., GCN19581) 31 sec after GBM notice time and 57 sec after GBM trigger (131 sec before LAT Trigger, Dirirsa et al., GCN 19580) at 2016-06-25 22:41:13UT . Starting from this time we continiously observed Swift X-ray error box (Melandri et al., GCN 19585) by MASTER-IAC wide field camera with 5 sec unfiltered exposition. We have several thousands frames. The OT appears at 22 43 30 (+- 2.5 sec) UT and rised to maximum ~8 mag after ~5 sec at RATIR position (Troja et al., GCN 19588). The prompt optical emission strongly correlated with Konus Wind gamma ray light curve ( Svinkin et al., GCN 19604 ). The delay with publication connected with installation new MASTER telescope at Argentina (http://master.sai.msu.ru/masternet/). Following GCN 19603 we present the reconstructed light curve of GRB 16062= 5B. One of four Pi of the Sky North detectors located at INTA - El Arenosillo observatory in Mazag=C3=B3n near Huelva, Spain imaged the region of GRB 1= 60625B (Swift-XRT error circle (Melandri, et al., GCN 19585), at a position RA, = Dec =3D 20:34:23.50, +6:55:8.1) before, during and after the GRB with 10s exposur= es (the exposures were taken in white light, IR-cut and UV-cut filters on= ly, to achieve deepest=20 detection limit). T0 is the Fermi GBM trigger 488587408 time (Jun 25 22:43:24.82 UT) and t is the time of shutter oppening. Each image taken covers approximately 40 0 square degrees. The magnitudo limit was about 12.5 mag. Using the ANDICAM instrument on the 1.3m telescope at CTIO, we obtained optical/IR imaging of the error region of GRB 160625B (GCN 19580, Dirirsa et al.) with a mid-exposure time of about 32 hours post-burst (2016-06-27 06:51 UT). Total summed exposure times amounted to 36 minutes in I and 30 minutes in J. The long-duration GRB 160625B (Burns et al., GCN Circ. 19581; Dirirsa et al. GCN Circ. 19586; INTEGRAL-ACS #7495) triggered the CALET Gamma-ray Burst Monitor (CGBM) at 22:40:15.49 on 25 June 2016. The burst signal was seen by all CGBM instruments. Furthermore, the main pulse was also detected by Imaging Calorimeter (IMC; plastic scintillating fibers) and Charge Detector (CHD; plastic scintillators), which are subsystems of the CALET main instrument Calorimeter (CAL). The incident angles for this burst was 61 degrees and 67 degrees from the boresight of CAL at the trigger time and at the main peak, respectively. The CAL gamma-ray analysis (>1 GeV) is in progress. Photometry is based on nearby USNO-B1.0 stars reported in GCN 19605 (Mazaeva et. al). Corrected text of the GCN 19619 (Mazaeva et al.) should be as follows. I thank D. A. Kann who noticed the apparent error. We observed Fermi GRB 160625B (Dirirsa et al. GCN 19580) with the 2-m LCOGT Faulkes Telescope North in Hawaii on July 01 from 11:12 UT to 12:46 UT with the SDSS-r filter for a total exposure of 1500 s. We clearly detect the optical afterglow (Troja et al. GCN 19588; Oates et al. GCN 19589; Kuroda et al. GCN 19599; Xu et al. GCN 19600; D'Elia et al. GCN 19601; Karpov et al. GCN 19603; Mazaeva et al. GCN 19605; Moskvitin et al. GCN 19611; Gorbovskoy et al. GCN 19612; Batsch et al. GCN 19615; Cobb et al. GCN 19616) with a magnitude of r=21.15 +- 0.15 mag at a mid epoch of 5.5 days post burst, as calibrated against nearby USNOB1 stars. A. F. Valeev, A. S. Moskvitin, G. M. Beskin, V. V. Vlasyuk, V. V. Sokolov (SAO RAS, Russia) report on behalf of the larger GRB follow-up team. We observed the GRB160625B field (Dirirsa et al. GCNC #19580) with two optical telescopes of SAO RAS: the 6-m BTA + Scorpio (B, V, Rc, Ic bands), and the 1-meter telescope Zeiss-1000 + CCD photometer (Rc band) at the June 29/30 night. We clearly detected an OT (Troja et al. ,GCNC #19588; Karpov et al GCNC #19603; Alexander et al. GCNC #19606) in our stacked frames. Preliminary Rc band results are shown in the following table. These estimations are based on the R2 magnitudes of the same nearby USNO-B1 stars as in our previous GCNC #19611. We observed field of Fermi GRB 160625B (Dirirsa et al. GCN 19580) at the position of optical afterglow (Troja et al. ,GCN 19588) with Russian-Turkish 1.5-m telescope (RTT150, Bakirlitepe, TUBITAK National Observatory, Turkey) using the TFOSC instrument. We obtained series of Rc exposures in June 30 / July 01(6 frames x 600 sec, UT = 00:21 - 01:30 ), in July 01 / 02 (4 frames x 900 sec, UT = 00:36 - 01:42), in July 02 / 03 (6 frames x 900 sec, UT = 23:49 - 01:29), and in July 03 / 04, 2016, (14 frames x 600 sec, UT = 22:50 - 01:39). 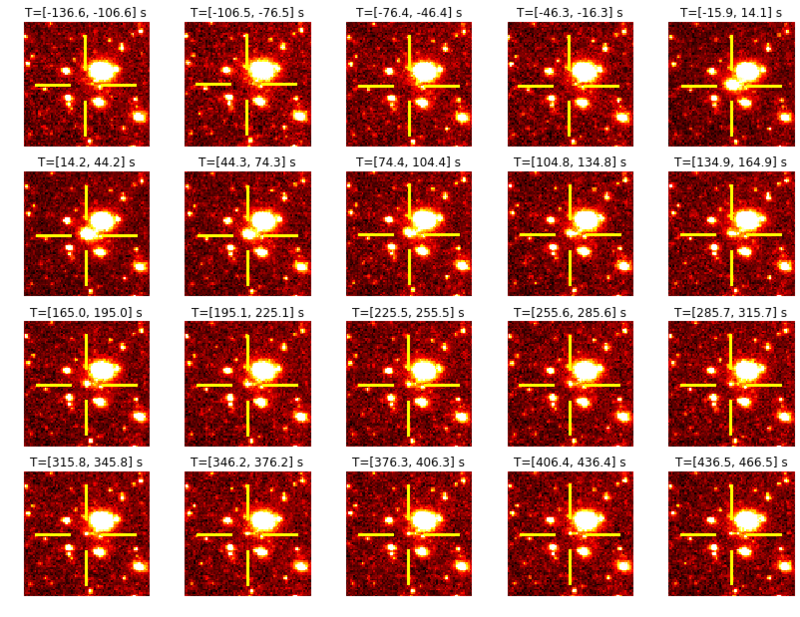 The optical transient (Troja et al. GCN 19588; Oates et al. GCN 19589; Kuroda et al. GCN 19599; Xu et al. GCN 19600; D'Elia et al. GCN 19601; Watson at al. GCN 19602; Karpov et al. GCN 19603; Mazaeva et al. GCN 19605, 19620; Moskvitin et al. GCN 19611; Gorbovskoy et al. GCN 19612; Batsch et al. GCN 19615; Cobb et al. GCN 19616; Guidorzi et al. GCN 19640; Valeev et al. GCN 19642) is clearly detected in each images. RTT-150 data show that OT is fading at approximately the same power law rate as it was observed earlier. The delay with internet problems last time .